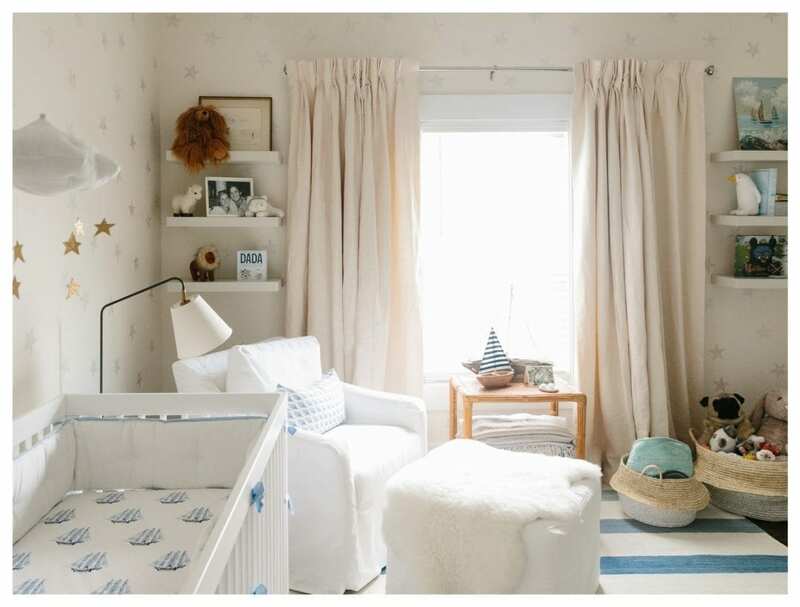 When we were getting ready to turn our blank guest room into a nursery for our son, we had a conversation about how we wanted everything in his childhood to be magical. 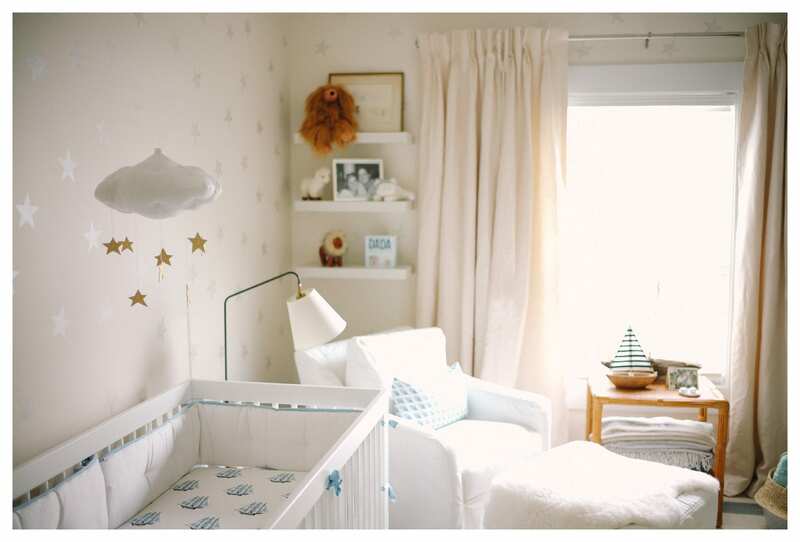 We became emotional there and then, preparing to stencil the silver stars onto his linen white walls, about filling his childhood with love and happiness and an environment free from stress. 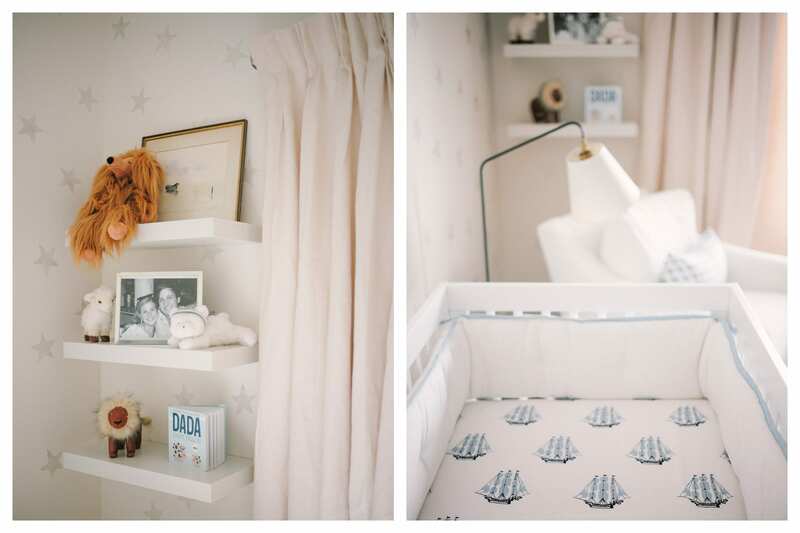 Looking back, this fun nursery inspiration has really set the tone for his first few months, and all the hours that we have spent in there (really – all imaginable hours of day and night, I cannot IMAGINE where would be without that glider!! ), it has always felt exactly how we hoped it – cozy, warm and peaceful. 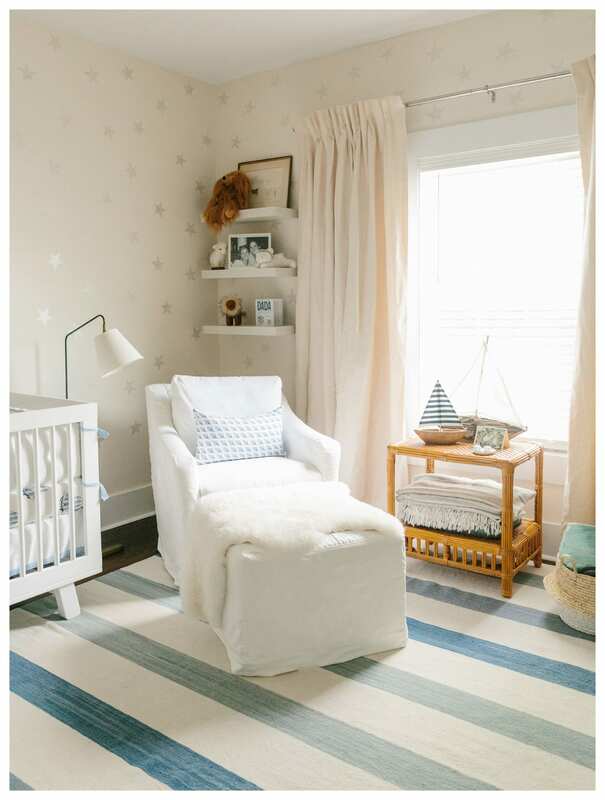 When I started to look around for what to fill this imaginary space with, I completely fell in love Serena & Lily’s nursery collection — everything is beautiful and classic but infused with a sense of play and wonder. Never did I imagine that I would with to source everything from one shop but Serena & Lily is spot on, not kitchy in any way, and it has quickly become everyone’s favorite room in the house. Will (my husband) is a british sailor and we met on a boat so it was particularly important to us that sail boats play a key role in decorating. We love these sheets which complement the lovely cream and playa stripe carpet. Pictured above is the crib skirt and bumper which I coveted for ages, I am so glad that we got them — that blue is my absolute favorite color. These round belly baskets have been amazing storage. 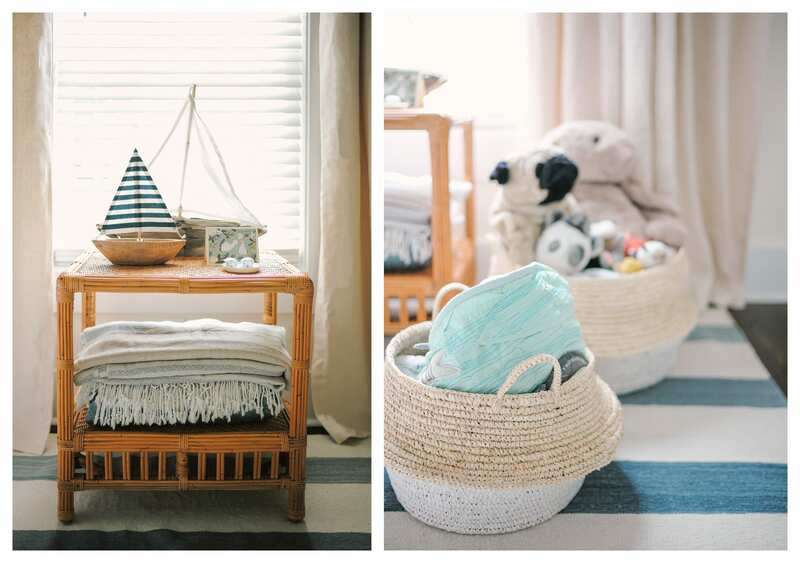 It makes it so easy to quickly tidy up the room, I toss all the baby toys and blankets in there et voila! These Palmer Linen Window Panels have been amazing, they’re surprisingly heavy and thick (not blackout) and so able to block out a lot of the light for daytime naps. We also love our Flynn floor lamp for reading. Our cat quickly sensed an opportunity and has ended up taking over the bassinet as her own! I hope that you find this nursery inspiration useful, please share your experiences with us below! Absolutely beautiful. And the serenity in that photo of you and your baby…my oh my! Hi Lucy! I also love the shelving in this room – where did you find these shelves and would you recommend them? Thanks! Hi Lucy! I love your beautiful nursery. Which colour are the walls? It looks so creamy!